Leading an active lifestyle will go a long way to reducing your risk of developing vascular disease. It will also help cut your risk of heart attack, stroke and amputation. Keeping active helps control your weight, increases your flexibility while lowering your blood pressure and cholesterol as well as improving your mental health and making you look and feel great. Before you become more physically active, it is important that you speak with your GP, especially if you have a condition for which you are already being treated or taking medication. Remember, being active does not mean sweating it out for long sessions in the gym; the simple acts of going for a walk or a swim, climbing the stairs or doing some gardening are all valuable ways of getting active. Aim to build up to 30 minutes of moderate physical exercise on 5 or more days a week. Moderate exercise will make your breathing faster and make you feel warmer than before you started. Clip a pedometer onto your trousers every day to gauge your activity levels. It's thought that 10,000 steps (about 5 miles) a day is hugely beneficial for your health and it's free and easy too. For your free pedometer, contact us in the office. As well as going for a daily walk, here are some helpful leg exercises you can do at home. Stand up straight and rise up onto your toes lifting both of your heels as high as possible, and then slowly return to the starting position. You might like to steady yourself by resting a hand on a piece of furniture. Repeat the complete heel raise action (up and down) in 3 sets of 10. If you start to feel pain, rest a little between raises, or if it is too much, stop altogether. Stand up straight and rise up onto the toes lifting both of your heels as high as possible. Keep your weight on your toes, and slowly lower your left heel to the floor. 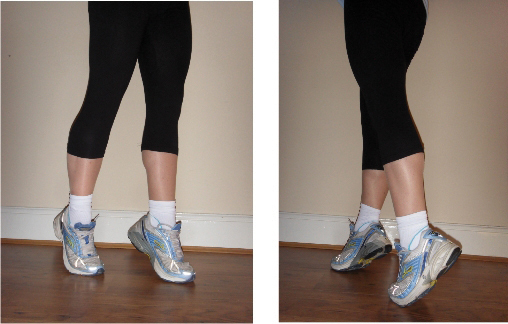 When your heel reaches the floor, start to raise the left heel up again as high as possible and at the same time lower the right heel to the floor. Aim to do 100 alternate raises. If you start to feel pain, rest a little between raises, or if it is too much, stop altogether. 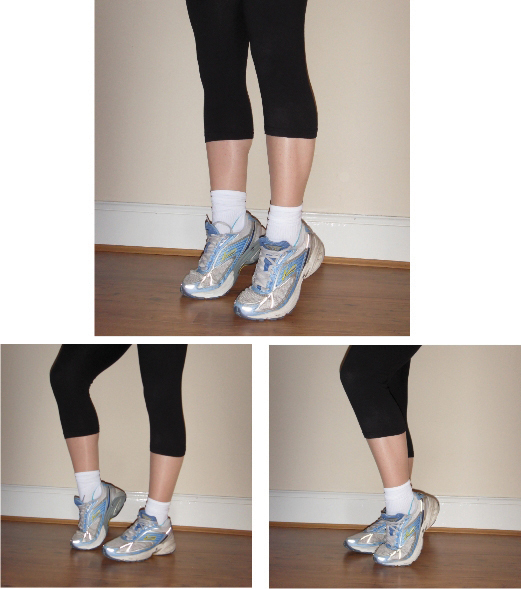 Stand in front of a low step, start by putting one of your feet onto the step and then bring your other leg to join it. Step back downwards with the leg you stepped up with first and then bring the other leg back down to join it. Aim to 50 steps up and down, take a rest, and them start the action again, completing another 50 steps, but this time leading with the other leg. If you start to feel pain, rest a little between steps, or if it is too much, stop altogether. Rise up onto the balls of your feet and walk, keeping your heels off the floor. Walk around the room, or up and down a corridor, until you get nice and warm and your breath quickens. Cool down and stretch after you have worked your muscles, drink plenty of water during and after activity and wear sensible clothes and shoes. Remember, it's never too late to start exercising and even small changes, like walking instead of catching the bus make a big difference. Set goals that are achievable, and help keep yourself motivated by varying what you do. Maybe you've always wanted to try ballroom dancing or trampolining, well, now's your chance! Taking up an activity with friends or family can make exercising more fun, sociable and enjoyable. You might be more motivated if you have a weekly class to attend and friends to see while you're there. When you achieved your activity goals, make sure to reward yourself with something nice, like a trip to the cinema, a new CD or perhaps your favourite magazine. A good diet is vital to vascular health too. See our tips for an healthy eating and to read more about other risk factors and how to minimise them, please go to the vascular health information page.